How beautifully the infamous Rumi managed to contain a multitude of emotions in a handful of words. 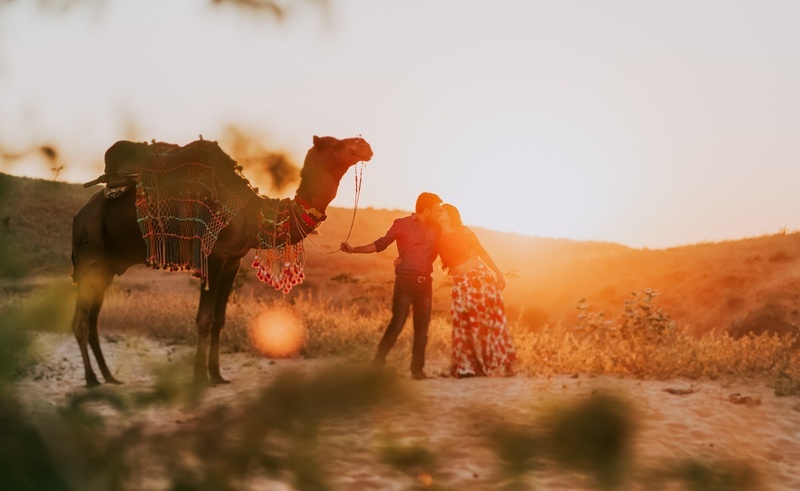 And that’s exactly what Varanjot and Ankit’s enchanting pre-wedding shoot in the Pushkar deserts shows is. The clear blue skies, followed by the setting sun amongst warm, golden sand and a calming, serene vibe created quite the mood for the lovebirds as well as the photographer, Avnish Dhoundiya. Rajasthani folk music, desert sand, the golden sunset, camels and a couple who can make poetic description of the word ‘love’ fall into shame. This is what these stunning pictures by Avnish Dhoundhiya are all about! One look at them and you’d be lost in the deserts yourself.